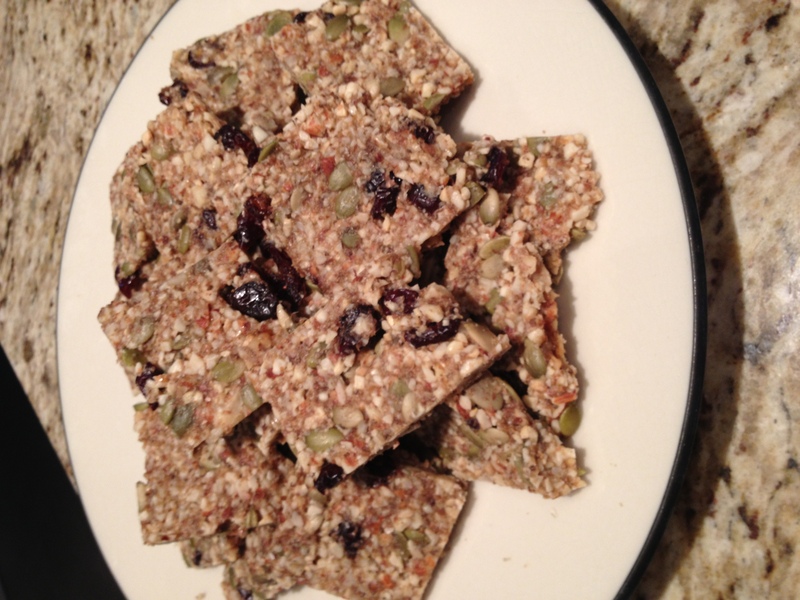 I am so excited to share this new cracker recipe with all of you! For months I have had a dehydrator laying around the house, and like so many home appliances it was hidden away in one of my cupboards mostly unused. 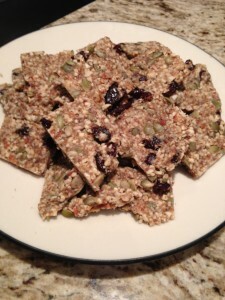 I decided that it was time to put it to good use so I created a grain-free cracker recipe that is packed full of protein and nutrients to help sustain you throughout the day. I am the type of person who always likes to keep snacks packed away in my purse and these crackers are perfect for just that! 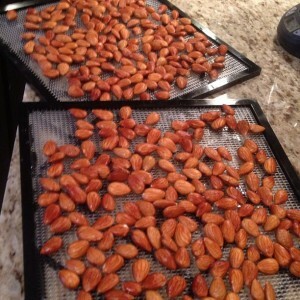 One thing that I have discovered is that my dehydrator is great for dehydrating nuts and seeds. You might be wondering why you would want to dehydrate already dry nuts. Well, in our house we like to soak our nuts, seeds and legumes in water to remove the phytic adic. 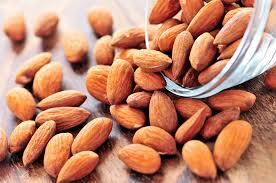 Phytic acid is found on nuts, seeds, grains and legumes and is actually referred to as an ‘anti-nutrient’. It tends to block the enzymatic activity of these foods and as a result makes them difficult to digest and can prevent the absorption of the beneficial nutrients that they contain. Since the soaking times for nuts, seeds, and legumes all differ here is a chart that you might find handy if this is something that you wish to do – http://www.veggiewave.com/soaking_chart. Soaking is also recommended for grains when possible. Once you have soaked these items you will want to dehydrate them to make sure they are nice and crispy for taste and also to prevent any mold from developing. Here are the simple steps on how to create my Cranberry Pumpkin Crackers! They are not overly sweet, but you can certainly add in some cinnamon and extra honey to change that. If you prefer something more savoury you can try adding some rosemary and additional sea salt. I hope that you enjoy! 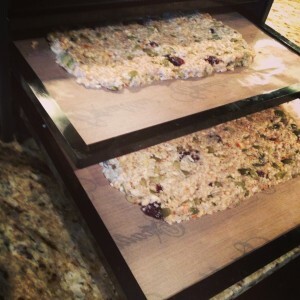 1) Mix together nut flours, chia/flax, cranberries, pumpkin seeds and salt. 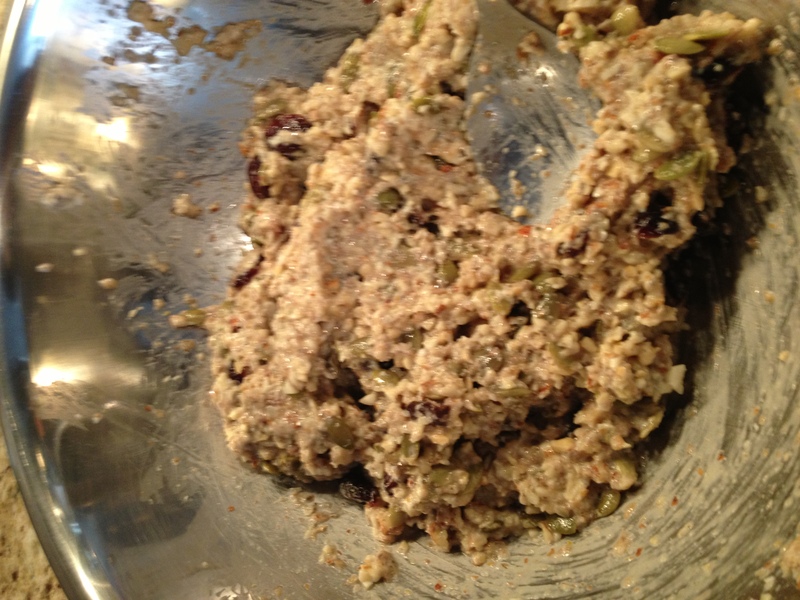 2) Add in the water and mix well. 3) Add in the honey and combine until smooth.